High quality and high style, this Safavieh Courtyard area rug is extremely useful in any home. This indoor/outdoor rug made from plush synthetic material is both comfy and stylish. This machine-made rug is durable and modern. This border patterned red rug makes a bold statement in your hallway, dining room, or even living room. Courtyard May Red / Natural 2 ft. 7 inch x 5 ft. Indoor/Outdoor Area Rug High quality and high style, this Safavieh Courtyard area rug is extremely useful in any home. This indoor/outdoor rug made from plush synthetic material is both comfy and stylish. This machine-made rug is durable and modern. This border patterned red rug makes a bold statement in your hallway, dining room, or even living room. 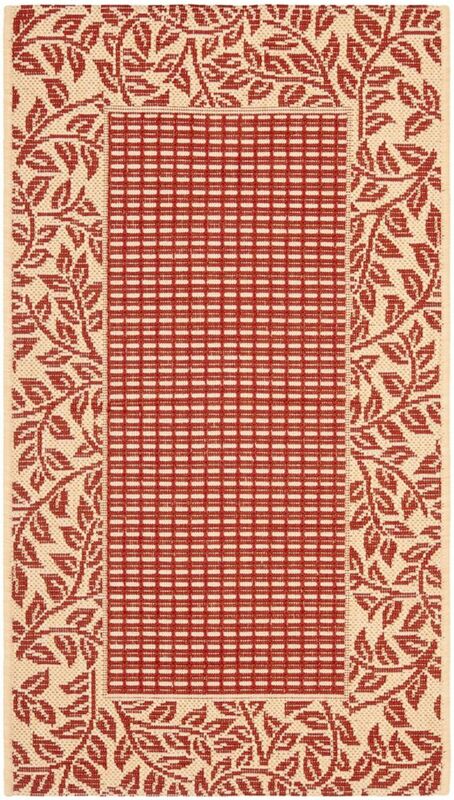 Courtyard May Red / Natural 2 ft. 7 inch x 5 ft. Indoor/Outdoor Area Rug is rated 4.8 out of 5 by 10. Rated 5 out of 5 by Alexander from Love these runners. Beautiful addition and protection to my newly... Love these runners. Beautiful addition and protection to my newly stained deck! Rated 4 out of 5 by Rbek from This rug is as it was shown and described. We use it outside where it will be severely tested by... This rug is as it was shown and described. We use it outside where it will be severely tested by the weather and UV light (we live at 6000' elev) and we're hoping these colors and fibers survive better than our previous "terra cotta" rug that only lasted one year. So far, it is beautiful and it was reasonably priced. Rated 5 out of 5 by shooboy from Perfect under our outside table on our deck. Perfect under our outside table on our deck. Rated 5 out of 5 by Vicky from Very pretty in person. The beige color matched my patio perfectly. Very pretty in person. The beige color matched my patio perfectly. Rated 5 out of 5 by NDgirl from Really love the size (I bought the round one) under my table & the design of the rug. I wish it w... Really love the size (I bought the round one) under my table & the design of the rug. I wish it was a little more orange than red but that’s just me. It says “terracotta” & it really is. Feels nice under foot. Bought in April 2018. Rated 5 out of 5 by Janet from I love this rug. Brick red on a tan... I love this rug. Brick red on a tan background. Looks very nice in my kitchen.